Visit http://www.insidebaseballoperations.com for contact details, excerpts, and an author bio. Author Bill Geivett, with more than 28 years of experience in professional baseball as a player, scout, and front office executive, takes the reader on a trip that is part steps to acquire that first baseball job, part personal insights and stories, and part mentorship in Scouting and Player Development. Major League Baseball has never been more popular than it is today, and learning the keys to unlocking the door to that first position in a baseball front office has never been more difficult. Do you want to learn the steps to how to acquire an interview? Did you ever wonder how baseball scouts evaluate young players? Do you want to learn about professional Player Development? 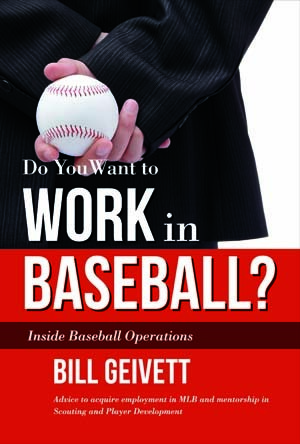 Bill Geivett offers his perspective to answer these questions and more in Do You Want to Work in Baseball? Praise for Do You Want to Work in Baseball? “Bill is an extremely experienced professional baseball man. A book he writes on Scouting and Player Development is one I would read.” Dayton Moore – General Manager of the Kansas City Royals. Bill Geivett has this to say about his book: “I’ve had an incredible life in baseball with a lot of great moments, my share of heartbreak and some pretty amazing experiences. I’ve experienced the day-to-day life at the lowest levels of the minor leagues, and I’ve been a front office executive with a team participating in the World Series. I’ve pretty much seen it all! I have learned great lessons from some of the best teachers in baseball. My hope is that others will gain from my professional baseball experiences and this book will help them fulfill their dream of a career in sports.